Product #20544 | SKU AUDSCX1HC | 0.0 (no ratings yet) Thanks for your rating! 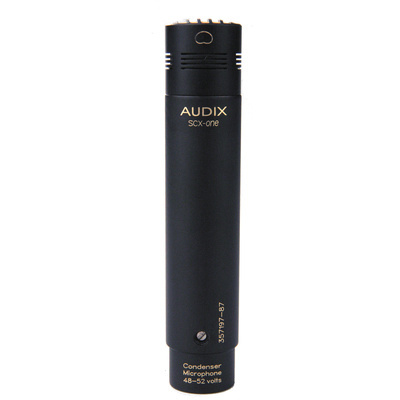 The SCX1-HC Studio Condenser Microphone from Audix offers a versatile condenser microphone system that can be used for vocal, general instrument, and ambiance capturing applications. It features a modular capsule design, allowing you to switch the included hypercardioid capsule with separately sold cardioid and omnidirectional capsules. When used near monitors and speakers, the hyper-cardioid polar pattern provides maximum signal rejection at the off-axis sections of the microphone head, providing a low noise floor and high gain-before-feedback response. Transformerless circuitry and surface mount technology provide a compact profile and quiet signal response with a low noise floor. The microphone's high sensitivity and wide frequency response are suitable for use with vocals, guitar, strings, drums, percussion, overhead cymbals, and similar sounds. A high SPL rating of 130 dB enables the capsule to accurately pick up transient (peaking) signal without noise caused by distortion overload. The package includes an external foam windscreen for reducing wind, sibilance, and pop noise, a nylon moulded snap-on clip, and a foam lined wooden case. The hyper-cardioid polar pattern provides maximum signal rejection at the off-axis sections of the microphone head, providing a low noise floor and high gain-before-feedback response. A modular capsule system allows you to switch the included hypercardioid capsule with separately sold cardioid and omnidirectional capsules. Surface mount technology provides a small, compact profile for quick, easy, and unobtrusive microphone placement. Transformerless output circuitry results in high signal to noise ratio and high signal output.